Do you ever look at all the toothbrush options at the store and wonder what the difference is between all of them? 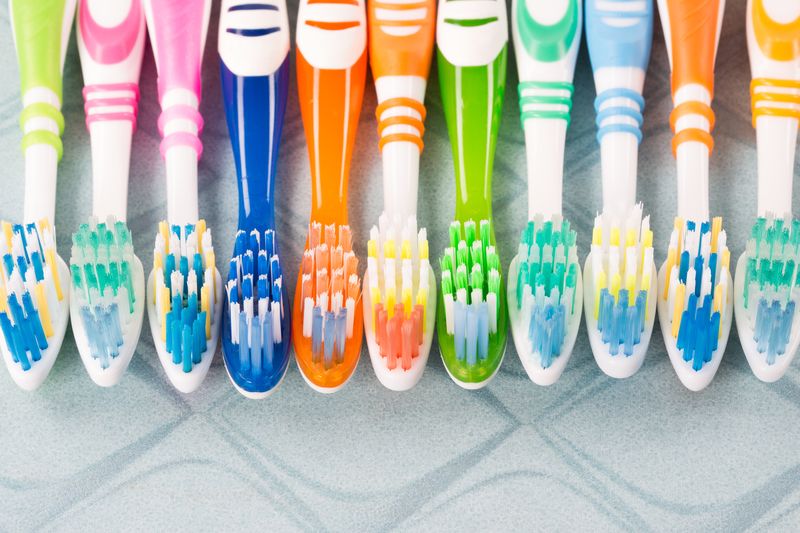 Toothbrushes come in all shapes and sizes, and it’s for a reason. They are made to fit certain sizes of mouth. Bristles come in various materials and designs, and there are extra features on some toothbrushes. So what should you choose? Use these tips for the next time you pick out your toothbrush so you know you’re getting a good one for your mouth! Why So Many Different Kinds? For something that is so simple to use, there sure are a lot of different toothbrushes out there. Toothbrushes have been around for centuries, with some historians quoting them as being as old as 3000 BC! Ancient civilizations used a “chew stick,” or a twig that had a frayed end in which they would brush their teeth. The common bristled toothbrushes that we are so familiar with didn’t come into existence until around 1498 in China. The bristles that were used in these toothbrushes were actually hog hair that were attached to handles made of bamboo or bone. Even these evolved, though, into the toothbrushes that we use today, but instead with nylon bristles and plastic handles. Since World War II, oral health has increased in popularity and a variety of different toothbrushes have been invented. But which ones are best? How do you know which toothbrush is for you? Toothbrushes are specifically designed for different sizes and shapes of mouths, plus there are age-specific toothbrushes, like for children, that have smaller (or larger) handles and bristles depending on the age of the person. No matter what toothbrush you use, the principle behind it should be the same: improve your oral health care and prevent disease. Your toothbrush should be helping you do that, if you’re using the right one. There are basically two types of toothbrushes: soft-bristled and hard-bristled. Most dental professionals agree that using a soft-bristled toothbrush is best for cleaning plaque and debris on your teeth. Hard-bristled toothbrushes are not recommended as they are known to wear away your enamel and can lead to gum recession and lesions. Although they do remove more plaque than traditional soft-bristled toothbrushes, hard-bristles cause more damage than good, even when trying to get rid of tough plaque. Toothbrushes with small heads are also great to use because they can get into the hard-to-reach places in your mouth. When deciding between a small-headed or large-headed toothbrush, keep in mind that the size of your mouth should be the determinant for which one you buy. Those people with large mouths should use a full-sized toothbrush head, while those with smaller mouths should utilize a more compact head. Toothbrushes also vary in the type of the handle (non-slip grip or flexible neck), shape of the head (tapered or rectangular), and style of bristles (rippled, flat, or dome shape). Although there are a variety of kinds, ultimately the best toothbrush is one that fits your mouth and allows you to reach all of your teeth easily. To figure out which one works best for you, trying toothbrushes with different bristle styles or head shapes is recommended until you find one that is most comfortable. Manual or Electric: Which is Better? With the advent of the electric toothbrush, many people have been drawn to its ease of use and effectiveness. While manual toothbrushes have been used for centuries, the electric toothbrush is faster and more efficient. If you’re a diligent brusher, manual toothbrushes are a great option, but for those who want the toothbrush to do the work for them, electric is the way to go. Just like manual toothbrushes, electric toothbrushes come in different sizes and have a variety of replaceable heads. Electric toothbrushes are known for having smaller heads than manual, so at the beginning, it may take some time getting used to their small size. Because of their size, electric toothbrushes are able to clean teeth more thoroughly and get to hard-to-reach areas of the mouth better than manual toothbrushes can. Electric toothbrushes also use different types of bristles movements, such as oscillating/rotating technology, that has been proven to remove more bacteria and plaque than manual toothbrushes. Additionally, electric toothbrushes have a smaller likelihood of hurting your enamel and gums, which is advantageous for those individuals who have sensitive teeth and gums. Whether you choose manual or electric, the most important takeaway is that both fit your mouth size and allow you to clean each individual tooth. If your toothbrush can do both of those things, you’re on your way to achieving great oral health and a nicer smile. Having the correct toothbrush for your mouth is the first step in maintaining good oral health. 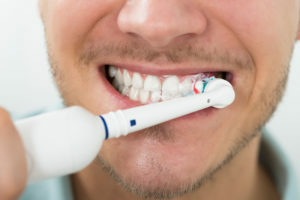 But a common question that many have is, “What is the correct way to brush my teeth?” When using a regular soft brush, make sure to angle the brush along the gum line and brush down from the top, then up from the bottom on each tooth in small circles. This motion helps get out the tiny food particles stuck between your teeth, plus it protects your gums from over-brushing. If your gums tend to bleed when brushing, that usually indicates that the gums are inflamed and those areas should actually be brushed more thoroughly and more often. Also make sure that you are brushing your chewing surfaces, the inside of your teeth, and your tongue. For more tips on how to protect your teeth and maintain a healthier mouth, visit your local provider at Belmar Orthodontics. Change your oral health for the better by calling (303) 225-9016 and setting up your first consult for the comfort, care, and personalized treatment that you deserve!